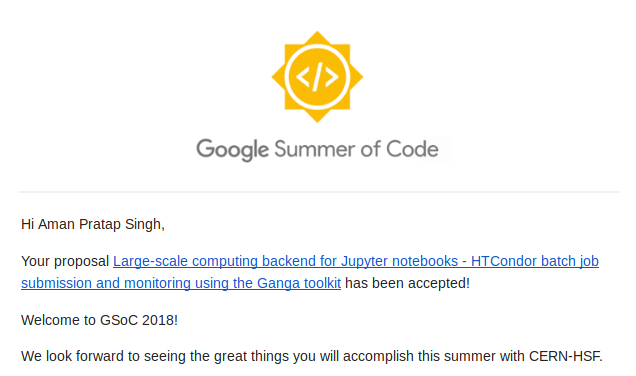 I have been selected in Google Summer of Code 2018 under CERN-HSF umbrella organisation. My project is co-mentored by HEP Software Foundation and Imperial College, London. This was the first time I applied for GSoC. It was my dream from the freshman year and I started preparing for it from a long time ago. I started writing code for fun, published it on Github, contributed to multiple open source projects. The first major milestone in my open source journey was in December last year when my first PR got merged in Jupyter Lab and I got an invitation to become part of JupyterLab organisation on Github. Later when GSoC announced selected organisation, I started searching for organisations. One of my college senior was GSoC 2017 student and he suggested me to apply for CERN-HSF. I applied for project Large-scale computing backend for Jupyter notebooks - HTCondor batch job submission and monitoring using the Ganga toolkit. On April 23, the results for GSoC 2018 came and my project proposal was accepted. tl;dr : My project involves creating a Jupyter extension for submitting and monitoring large-computation jobs from Jupyter based notebooks using Ganga Toolkit interface to HT Condor backend. The first phase for selected students was community bonding period which started on April 24th. In this period students familiarise with organisation’s community, understand code base, contact their mentors and decide their communication modes, meeting time etc. Fortunately, I have 5 mentors for my project (most of the projects have only 1–2 mentors). We decided to have a Skype meeting for project status reporting and other guidelines on each Friday for the project duration. The first coding phase started on May 14th. In this phase, I started creating Jupyter Extension for writing job details inside notebook. For this, I registered a Ganga Cell Magic in IPython kernel and then this magic compiles written job and submits it to Ganga. After submitting the job, kernel extension sends a job info message to frontend using Jupyter’s comm API. The frontend parses the received job info and displays a widget below Ganga Magic Cell. This widget contains all the job info like Appliation, backend, subjobs, splitters etc. After sending the job info, the kernel creates a new thread and send job status to frontend each second until the job finishes. The frontend widget consist buttons for killing job and resubmitting failed jobs. Creating a Ganga Jobs tab in Jupyter tree view to monitor Ganga Job Repository. Updating extension to facilitate job application script writing inside same notebook. Testing extension on real large-computation batch jobs using Condor backend. Testing plugin on CERN’s batch infrastructure. Integrating the extension to SWAN (CERN’s on demand notebook service). So this is all for my first GSoC blog. In my next blog, I’ll update the second coding phase(Jun 15-July 8) progress. If you have any query related to my project and just want to say Hi, feel free to ping me. Thank You for reading, have a pleasant day ahead.